Helen Chiasson and Kate Hickmott, Education Officers for Lewes Priory Trust, will talk about how the Priory of St Pancras developed to be important enough to host the King and his army during the Battle of Lewes and the role the Priory played in the Battle and its aftermath. 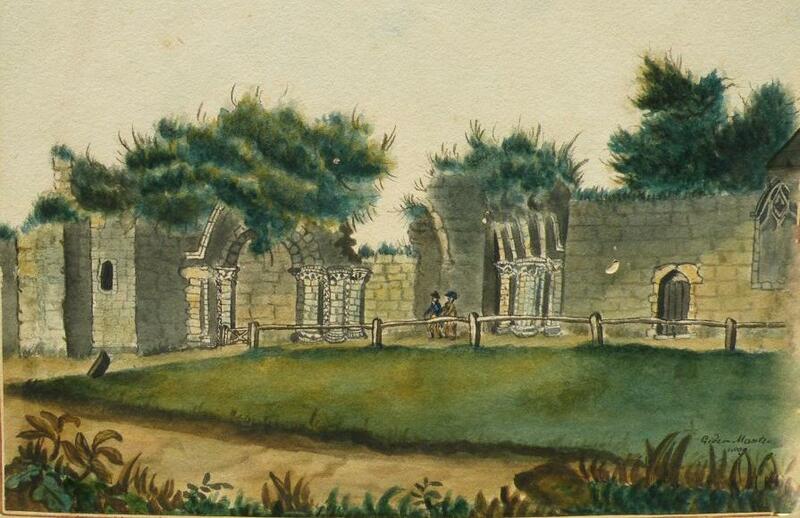 This picture of the Priory Gate on Southover High Street was by Mantell in 1809, and comes from the Lewes Priory Trust website, by permission from the Sussex Archaeological Society. This is a fascinating website, well worth a visit. This regiment, with the secondary name of the Royal Highland, was re-formed in Edinburgh in 1803, as part of the army to fight Napoleon. It sailed from Plymouth to Gibraltar in October 1804 and remained part of the garrison there until August 1808. It then joined the Peninsula army in time to participate in the retreat to Corunna. In 1809 it sailed back to Portsmouth, and spent a period in Shorncliffe barracks, Kent, and was stationed at Walcheren in the Netherlands, Dover and Canterbury before returning to Musselburgh, just east of Edinburgh, in July 1810. In August 1811 it was moved to England, and was stationed in Lewes, Hailsham, Eastbourne and then Lewes again, before in April 1812 sailing from Portsmouth back to the Peninsula to join Wellington’s Army. Its battle honours included Salamanca and Vittoria, before moving with the Peninsula army through southern France to Bordeaux. It then sailed to Ireland in June 1814, being stationed at Cork, Dundalk and Kilkenny, where it was reinforced. In May 1815 it was sent to Brussels, where it was engaged at Quatre Bras and Waterloo, before entering Paris as part of the Army of Occupation. It returned home in December 1815. Such a regiment would carry, even when serving abroad, a tail of wives and families to provide the services their menfolk needed. One can see that such a man would have very different tales to tell. A Lewes girl who fell for a red coat might have a rather more adventurous life than her stay-at-home sisters. If at any point she decided not to venture onwards with the Regiment, she and her children would be ‘sent home’ to her husband’s parish of legal settlement – and before the Regiment moved on the Lewes parish officers would need to enquire diligently just where that might be. Source: “British Regiments and the men who led them”: napoleon-series.org. Councillor T. Patrick told the Town Council on Wednesday that the Borough Surveyor attended an important conference in London on May 28th, with reference to the working hours of municipal employees. The Council had reduced the hours of their men from 56½ to 50 hours a week. The recommendations of this conference were somewhat below that. Many members will recall the excellent presentation of the Chapel Hill street story last October by Meg Griffiths, Mary Benjamin and Shan Rose. This was not only our best attended meeting ever, but also an original account of research carried out by local people – exactly what we had in mind when the History Group was founded. Our aims of course must include not only encouraging members to do such research, but also preserving what they discover and making the information publicly available. 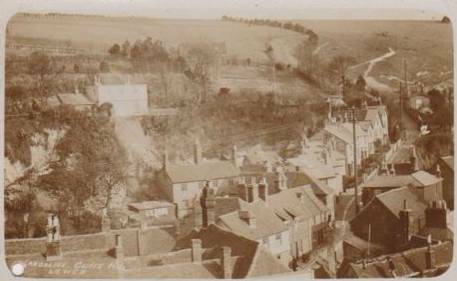 Meg, Mary and Shan have now prepared a written version of their work on Chapel Hill, which is available on the Lewes History Group website. This postcard titled “Landslide, Cliffe Hill, Lewes” attracted heavy bidding when advertised on ebay this month. This is the story of my great-great-grandfather, Henry Strevens who was born in Brighton in 1805. The christening records show Henry was baptised at St Nicholas Church in Brighton on Sunday 31 March 1805. He was the third child of Henry and Lucy Strevens. The Strevens name has many different variations in spelling and the records can show Strivins, Streffins, Strivens and even Stevens along with many others. 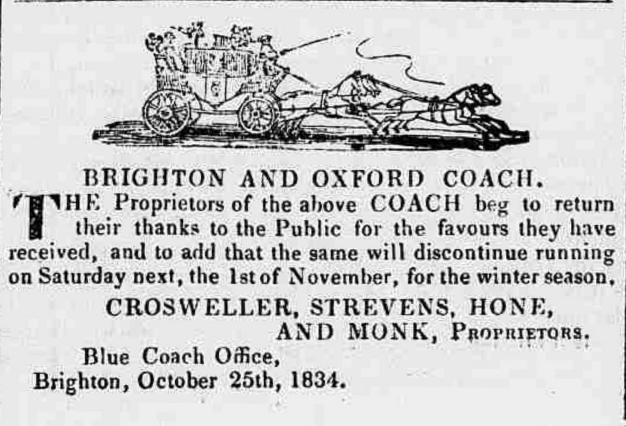 Henry was born into a family who were Brighton coaching proprietors, as the advertisement below from the Sussex Advertiser shows. Along with Crossweller, Hone & Monk they ran coaches to places like Tunbridge Wells via Lewes and London via Crawley and Reigate. Unfortunately very little is known of Henry’s childhood. We do know that Henry was to work in the coaching industry himself. He probably started at around the age of 10 years of age as a groom, or stable boy, and worked his way up to become a driver. Henry was about 20 years old when he met the lady he was to marry. This was Mary Jupp, who lived in Lewes. Whether Henry met Mary in Lewes while travelling on the coaches would again be speculation but it would be certain that Henry would have been training as the driver or maybe just learning the route. 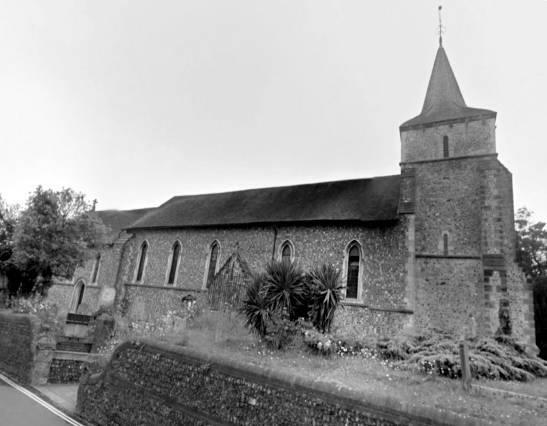 Whatever the circumstances of their meeting, Henry and Mary were married on Sunday 3rd June 1827 at St Anne’s church, Lewes, pictured below. In 1828 the couple had their first son, my great-grandfather, who they named Henry. He was followed by two more sons, John in 1831 and William in 1833. All three were baptised at St Nicholas in Brighton so I assume this was where the family home was situated. Henry worked for the Blue Line Coaches and the main ticket offices were situated in Castle Square Brighton, at what is now known as Pavilion Buildings. From here a Mr Fleet drove the coach called the Royal Blue to Tunbridge Wells via Lewes, Uckfield, and Tonbridge for six days a week leaving around 8 a.m. on Monday, Wednesday and Friday and returning on the alternate days. Unfortunately Mr Fleet was killed when the Royal Blue overturned in Tunbridge Wells on the Sunday 19 February 1832. This tragedy allowed Henry Strevens to take over this coach and the route. This was to start a chain of events which led to disaster. About 2.45 p.m. on Thursday 23 October 1834, Henry changed the horses, as he normally would, at the Crown Inn for the final leg back to Brighton. He was carrying 3 female passengers inside the coach. He then set off, but when he reached the site of the late barrack ground the horses shied at a passing cart and darted up the banks of the causeway of the turnpike road. With the off wheels gathering the high ground the coach turned over into the turnpike. The female passengers were unhurt but Henry was trampled by the startled horses into unconsciousness and suffered a broken arm and other injuries. The ‘late barrack ground’ is thought to be the site of the present Lewes Prison. According to the District Council’s Lewes Historic Character Assessment Report, the Lewes barracks had moved to this site in 1803, but the barracks were demolished in 1814, shortly before Waterloo. Henry was conveyed to the Crown Inn, possibly the Crown Shades which was its coaching part. He never regained consciousness and died at 10 p.m. on Monday 27 October 1834. His widow, Mary, became a Turnkey at the Lewes House of Correction on North Street, and later married a Thomas Cox, a shoemaker from Lewes. The 3 boys, including my great- grandfather were destitute and put into the workhouse. “The following is an extract from a letter sent from Edward Hollands, a private in the 17th Lancers now serving in the Crimea, dated December 13th 1854, to his friends in Lewes. The Friends of Lewes, the town’s Civic Society, is leading a call to local residents for information about historic and important buildings in the town at risk of loss or dilapidation. English Heritage has been gathering information on the physical condition of our ‘built heritage’ for some years now. Its very first “National Register of Listed Buildings at Risk” was published in 1998 and recorded all Grade I and II* buildings at risk from neglect . This list includes not only buildings, but also structures such as boundary walls, tombs, memorials and the like. The current Heritage at Risk Register records information on a wider range of protected historic places, including battlefields and archaeological sites. However, it still only includes information on Grade I and II* listed buildings. Responding to this knowledge gap, the South Downs National Park Authority has identified Grade II buildings at risk by a similar survey, using the English Heritage methodology. The resultant provisional list for Lewes was short – including two solid but sagging table tombs, some rusted railings around another monument and a Gilbert Scott telephone kiosk. Friends of Lewes recently held a seminar for interested groups to consider whether any interesting historic structures had been missed. Those represented included the Lewes Conservation Area Advisory Group, the South Downs Society, the Sussex Heritage Trust, Lewes Town Council and officers from both the South Downs National Park Authority and Lewes District Council . There are some obvious candidates, such as the stretch of the Town Wall behind the Masonic Lodge in Pipe Passage and what is probably the remains of a kiln for pipe-making. But what about less obvious remnants of our agricultural past, like old barns and farm buildings in a traditional Sussex style? Unprotected by statutory listing, the buildings in Castle Ditch Lane nevertheless help tell the story of Lewes. Many buildings have much older, even medieval, origins than may appear evident at first sight. Re-used remnants of Lewes Priory, or the former religious buildings at Malling, may turn up in later houses or walls. Other buildings may contain timber-framed elements, or other historic features, unseen from the outside. Even some listed buildings – like those that flank the Grange Gardens – may be at risk, as after lead was stolen from their roofs, water was allowed to penetrate the walls. So here is a call to the people of Lewes, use your eyes, and please let us know!Contact Friends of Lewes by email at enquiries@friends-of-lewes.org.uk or, by post, c/o The Town Hall, Lewes, BN7 2QS. This entry was posted in Biographical Literature, Family History, Lewes, Local History, Military History, Social History, Transport History. Bookmark the permalink.